It is about when the black stallion was a colt growing up in the desert and all the adventures that follow. Really good movie, about 45 mins long. I saw it years ago and loved it and I forgot what it was called so I could not watch it again and now I found it, can't wait to watch it.!!!!! This is like my my "rainy day when I can't ride" movie! I love your story because I like horses! I read about this in HorseWyse magazine, and Ali Al Ameri was in it! I thought this movie was great. It was very sweet and heartwarming, while still being adventurous and exciting! I just wish it was longer! I love the young black stallion, it's so cute. my favorite part is the end when they win the race. hi all horse lovers go to to www.horsechat.com you can chat to everyone my user is horse_lover. and there is www.howrse.com and www.horseland.com. I know of horse movies running free, all roads lead home and blackbeuaty. i have horses. Did you know that in this movie, they never used a stunt person for the main girl? She was just an experienced rider!!! woah that was a great movie! glad i looked it up. i could watch it forever! is it ok for smaller children? 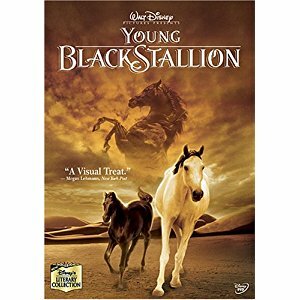 The Young Black Stallion is a very good movie, I just watched it and I loved it. I believe it's one of the best movies out there about horses.